Blackcutwitch Designs: Not sure yet! She looks a lot like a very beautiful friend of mine! The clay is a stonewear, grogged white. 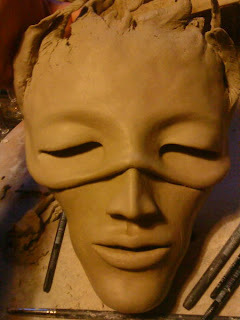 She'll be finished with a crystal glaze on the mask and some silver mosaic.